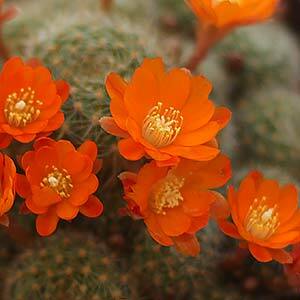 A group of very colourful and small growing cacti, Rebutia are also very popular and commonly called the Crown Cactus. They flower easily and grow very well in containers. These are a group of succulents, and they do come from South America, however as they are mainly found in the foothills, they grow well in cooler temperate climates. As with most succulents the important factors are light, watering and drainage. Rebutia are best grown in strong filtered light or good morning light with part afternoon shade especially in warmer climates. These are plants that naturally grow on hillsides and rock faces, drainage need to be excellent and watering controlled. In winter, watering is kept to minimum, when the plants are in active growth, water well and then let the growing medium almost dry out before watering again. A simple test for moisture is to stick your finger down into the growing medium. A specialist cactus and succulent potting mix is best. You can use a normal potting soil with some gravel mixed through, or maybe some perlite. Always ensure that the drainage is fast. Only light amounts of fertiliser are needed. If you repot every 2 – 3 years as recommended, then no extras fertiliser will be needed. These are a plant that will form a clump in 2 – 3 years and need to be repotted to prevent overcrowding. This is also a time to divide the plants. Use a pot that is not to large, remove the old potting soil and repot and new cactus and succulent mix. 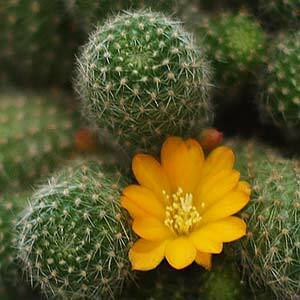 The easiest way to propagate Rebutia is by division or removal of offsets. The best time to do this is in spring. As with most succulents, you do need to allow any cut area to callus over before potting up. This helps prevent root rot and fungal problems. R. fabrisii – Orange red or yellow flowers depending on variety. R. miniscula – Attractive mid pink flowers. R.musclula – Low growing, clump forming with orange flowers. R.albiflora – Very attractive with white flowers as the name suggests. R.marsoneri – Small growing usually with yellow flowers.